Summon: Look at two of your opponent's cards. Guess the one in their hand. If you're right, give all creatures in your hand +1/+1. 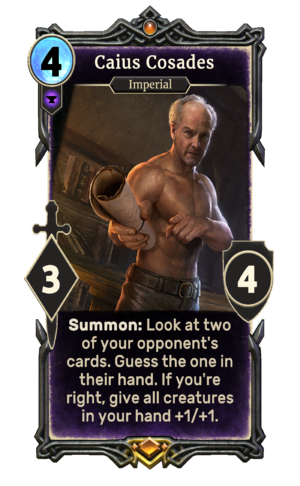 Caius Cosades is a unique legendary Endurance creature card. It is part of the Houses of Morrowind expansion. "A spy? No... I'm just an old man, with a Skooma problem." This card's summon ability applies the Qualified card effect. There's an action card with similar effects depicting Cosades, named Caius' Machinations. Caius Cosades also appeared in Morrowind. This page was last modified on 2 March 2019, at 00:33.